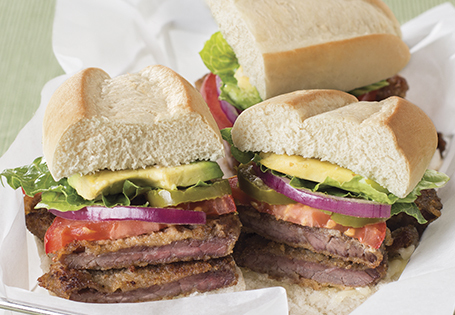 A traditional, savory Mexican sandwich. Place bread crumbs in a shallow bowl and set aside. Dip the steak in the eggs, then in the bread crumbs, making sure to coat both sides evenly. In a medium skillet, heat the oil over medium-high heat. Sauté the meat 2-3 minutes per side, or until golden brown. Remove the meat from the skillet, but keep the oil and skillet warm. Cut meat into ½-inch strips. Open deli rolls. Spread the mayonnaise or sour cream onto one side; top with beef strips. Layer a few slices of tomato onto the beef, then add slices of onion and jalapeños. Cover with lettuce, finish with the avocado slices on top. Place the torta back in the skillet and brown on both sides, pressing down with a spatula. Serve warm.